The American Trucking Association’s (ATA) recent survey shows that Americans hold a favorable view of the trucking industry, which is good news for an industry that desperately needs drivers. The survey used Public Opinion Strategies to survey 800 voters throughout the U.S. When asked what opinion they had of the trucking industry, 65 percent responded that they had a favorable opinion. Only nine percent said they had an unfavorable opinion, and the remainder had no opinion. As for the perception of the trucking industry being unsafe, only five percent said they felt the safety record for the industry was poor. An even more positive result coming from the survey is that 80 percent of those polled said they believe truck drivers are safer on the road than drivers in non-commercial automobiles. Nearly three-quarters of those surveyed said when accidents do happen between a truck and an automobile, it’s the fault of the driver in the passenger vehicle rather than the truck driver. The favorable numbers for trucking are higher than the public perception of the railroad and airline industries. For instance, 30 percent of Americans hold an unfavorable view of the airline industry. Trucking companies have worked to improve the public’s perception of the trucking industry since its hey-day in the late 1970s when popular television programs and movies glamorized the trucking lifestyle. The ATAs recent survey shows that fewer Americans believe truckers are placing a priority on meeting their deadlines than on safety. Previous studies conclude that the public felt drivers exceeded the speed limit frequently, that they were involved with drugs, drinking and violence. The industry currently has a driver shortage of about 30,000 drivers across the nation. However, that number pales in comparison to what trucking companies are expecting in the next decade – a shortage of 200,000-plus drivers. The industry is looking at demographics where it can work to pull in new drivers. One major demographic is female drivers. NPR reported recently that females that have been attracted to the industry enjoy the good benefits, good pay and the freedom of the road. 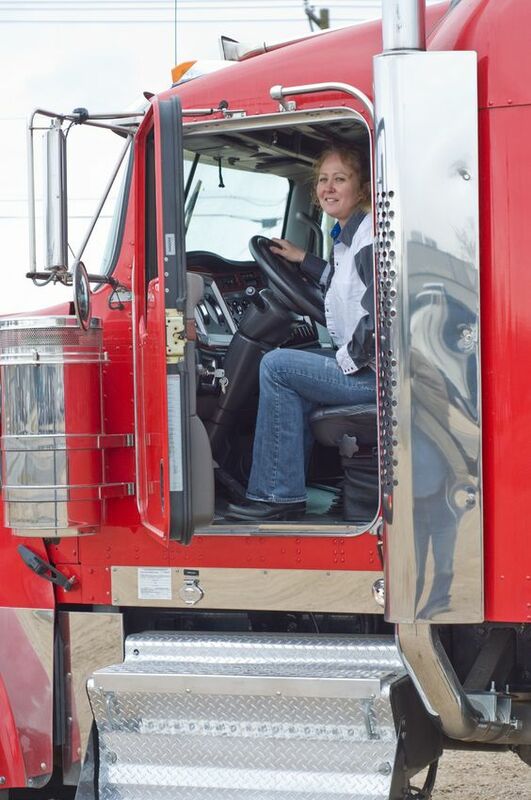 Women have been historically a largely untapped resource for the trucking industry. A salary for truckers is an average of around $38,000 a year, but can go much higher for long haul truckers. For people weighing the option of four years of college and an average student loan debt of $25,000 against a few weeks of classes to get the necessary license to drive a big rig, industry experts are wondering why such a large number of trucking jobs are still open. As the economy continues to improve, more people are spending money, which means manufacturers need to ship more cargo. The bulk of the increase in cargo is put on the shoulders of the trucking industry rather than railroad or boats. This is the big part of the reason so many more jobs will become available. Another is that many of the Baby Boomer truckers are retiring. If you’re looking for a position with trucking companies, consider Spirit Miller Driveaway Services. If being a long haul trucker doesn’t sound like something you would enjoy, we’ve got routes that will get you home every day. We have pickup and delivers seven days a week, so you have a wide range of shifts to choose from. Contact us today and get started on your new career.